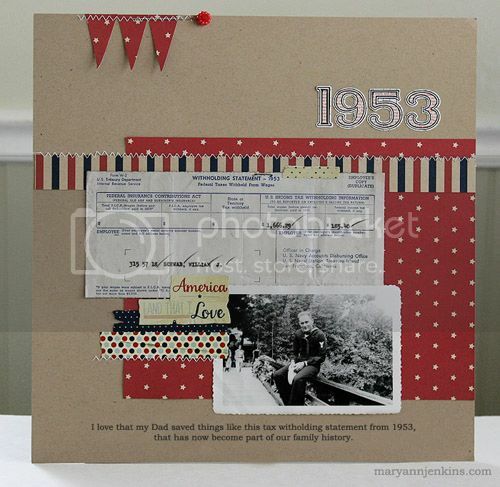 Here's a layout made with the June add-on kit from the Paper Bakery. I used one of my Dad's old Navy pics, along with his withholding statement from 1953. Wow!! 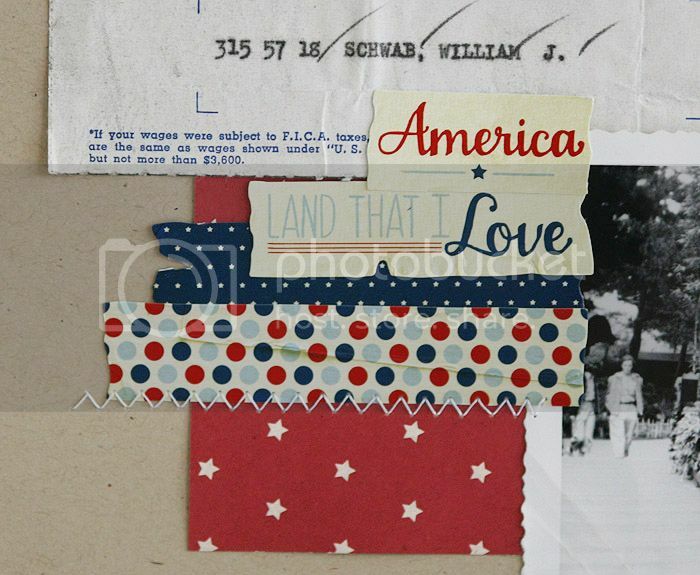 This is an example of scrapbooking at its finest! This is so cool that you have this! My grandmother found some old stuff like this when she was cleaning and I've been trying to figure out how to incorporate it. I love that you used an official document on the page. Such a great thing to document! I love history like this, so neat. gorgeous blog and gorgeous work. I found your blog by following a link on two peas and have started following you. I hope you're able to check out my bloggy space sometime. oooo i just love that. what a great tribute and very cool memorabila. This is so cool, I love the colors with the kraft, the little banner stitched on and the photo. Very nice! This is amazing! It makes me want to crawl through my parents' attic to see what goodies I can find. This is wonderful, what a great use of that older photo. I have several of my dad and always looked at them as a challenge because they were smaller. Wow! Love this! The colors are perfect! Beautiful layout! I love the use of the ephemera. Great page, Mary Ann!! I love the kraft background and the reds!! Great job incorporating the memoribillia, also! what a special page! LOVE it! Oh, this is lovely! I love the title against the kraft background! What a great memory. Love the red and blue on kraft. Oh, man, that page is so awesome! I love it. Mary Ann, this is gorgeous. Fabulous title with those numbers and a very patriotic feel! Thanks for linking up at The Shaque.